In the age of social media, we’ve become accustomed to seeing everyone’s highlight reel and comparing ourselves to fluffed up, often unrealistic standards. Many of us are plagued by a constant state of doubting our self-worth and feeling like we’re not enough. But what could you achieve if you simply slowed your scroll, took a break from the constant stream of external influences, and focused inward? What would happen if you redirected that time you spend influenced by negative energy, and put it to good use? Our guest today, Drew Canole, has done exactly that. He is passionate about inspiring others to push past their limitations, learn to overcome their past mistakes and traumas, and create a life that they love. His story of triumph and transformation will motivate you to reach your greatest potential as well. How Drew’s traumatic childhood experiences gave him deeper levels of compassion. The therapeutic release that occurs when you forgive others. Why being focused on external factors can stunt your growth. What it means to detox your life. How to begin ridding your life of toxic relationships. Why you should take a cell phone detox. What the Law of Non-Interference is (and how to practice it). One of the biggest limitations that most of us face on a daily basis. How trauma keeps us small. The importance of engaging in creative habits that you enjoy. How starting with one small change can transform your entire life. The truth about how imaginary boundaries divide us. How to change your reality through practicing visualization. Pre-order You Be You by Drew Canole and claim your free gifts! Listen, recently I just went on a trip to Utah for the first time, my first time in SLC, and I realized that the episode that I did on emotional intelligence, that it had such a carry over, even as I did the episode itself, I started thinking about all these different places in my life that I experienced this as kind of an environment that I put my own children in, and seeing how their emotional intelligence has developed. So the reason I'm bringing this up is on this trip, I told my little son, I was like, "Son-" this is my youngest son, Braden, he expects me to come back bearing gifts. If Dad goes on a trip, I need to come with something in my hand for him, alright? And I've trained him to be this way, because you know, we'll say fifty trips I've been on, forty-nine times he's gotten something, you know? He's gotten a gift. And I told him before I came, I was like, "Listen, buddy, I'll take you this weekend, we're going to hang out, and I'll get you something when I get there." And he was like, "Okay." Right? So he was just like, "It's okay." But I'm like, okay, maybe he'll process it and he'll be cool. Right? So I get off the plane, my wife picks me up, he's in the backseat, he's not even giving me eye contact. He's ignoring my existence. I'm like, "Are you serious right now? I thought we had an agreement." You know? And so I still- you know, I gave him a little hug, a little kiss, like, "Alright, it's good to see you, Braden." And then you know, I got in the car, got the real love from my wife who actually is happy to see me, and we're just going on about our business. And maybe like five minutes down the road driving along, he says, "Excuse me. Excuse me, Mom. Dad, I'm sorry." And he apologized for throwing this little mini kindergarten level shade at me. Right? He was aware that he wants to be happy, you know? He was aware that that probably didn't make me happy, and we had a communication and agreement, and so I thanked him for that, and I also shared that, "Listen bud, I was giving you a bigger blessing, a bigger option. We're going to take you somewhere fun, and we'll be able to get you a gift this weekend." It's just having that delayed gratification, which I know he has that capacity, and that's one of the things that we talked about on that episode is that's one of the muscles to develop in increasing your emotional intelligence, is delayed gratification. Alright? So that was just a little spot experience that I had, and it's just another caveat and a little press for you to make sure you listen to the episode. Do some of the exercises because it's a great valuable gift that creates more happiness in our lives, and ultimately that's what we really want. So man, speaking of emotional intelligence, man. My guest today, man he's done the work, and it's really remarkable just to see his growth and his impact, and I'm very, very excited to have him on the show. Listen, one of the other things- this is huge. Huge in the context of my family is our food, alright? And saving- it's like feeding a small army. When I have a teenage son and little Braden, too. Little Braden gets in his moods and he goes ham on food, alright? And so you know, our biggest expense really, kind of monthly bill for our household would be food a lot of times. And it's just crazy, you know? Because of course we're going to more expensive places, tends to be getting organic, getting grass-fed this, getting non-GMO, whatever it might be. Right? Spending that premium because we are the greatest investment. Just hands down, that's already a given, but it still kind of hurts sometimes, you know? And so this is why I love Thrive Market so much, because they're taking those same products that you would see at Whole Foods or the local mom and pop health food store, and they're literally saving you 25% to 50% off the retail price that you'd be paying. It is absurd. Like when I met the CEO of the company, I was puzzled. Like I seriously was like, "I don't know how you guys are existing. Like I don't know how you're going to make money because you're saving me so much," and I want other people to know about this. And they're curating the very best products as well, so you don't have to do a lot of like searching trying to find the best thing. They're getting the very best companies, the most ethical companies that are doing the right thing down the line from their processing everything, and providing that to you. Alright? At this incredibly discounted rate. So head over, check them out, www.ThriveMarket.com/modelhealth. Again, you get 25% to 50% off coconut oil, nut butters, snacks for the kids, personal care products, household products, laundry detergent, everything. It's nuts, man. Head over, check them out, www.ThriveMarket.com/modelhealth and guess what else you get? You get an additional 25% off your entire first purchase in addition. You're welcome, you know? Just head over there, check them out, take advantage, plus you get free shipping as well. Because that can be a deal breaker for me. Alright? Oh I saved all this money, but then I pay shipping. You know? So you get free shipping as well, free thirty-day membership, and just keep the membership because it's just going to keep saving you money. I've saved hundreds and hundreds of dollars already this year, alright? We're getting close to a grand. We're getting close to saving $1,000 this year, alright? So head over, check them out, www.ThriveMarket.com/modelhealth all together as one word. And now let's get to the iTunes review of the week. ITunes Review: Another five-star review titled, 'You Can Stop Searching for That Perfect Health Podcast: It's Here,' by TonyInChicago. "I discovered Shawn through Eric Thomas' Secret to Success Podcast. I had been looking for more health audios and podcasts, and this seemed to fit the bill. Shawn is one of the first people I've found to be helpful while still being human, vulnerable, and truly wanting us to succeed. In addition, his book 'Sleep Smarter,' has been a game changer for this light sleeper over here. I talk about Shawn every time my friends and I bring up health and finding better options. There's literally nothing to lose by listening. It's free. Thanks for what you do, Shawn. Looking forward to learning more from you." Shawn Stevenson: Man, Tony, thank you so much for taking the time to leave that. He just said all of our favorite price: free. Alright? We can all get down with that, but the thing is, it's still an investment of your time, you know? It takes a certain kind of person to click play on a podcast to better themselves, right? To better their health, to change their mindset, and that speaks volumes, you know? And so I'm so grateful. And also to hear that it was through ET that you found out about me, that's my family, and we've got an event coming up in San Francisco. He's the very- he's the best speaker in the world. Hands down, no comparison, he's in a different universe, and he's coming- we're coming. San Francisco, August 26th, get your tickets now. It's coming up right around the corner, it's your opportunity, come have this incredible experience. Take Control Conference, we're talking about mastering your finances, your relationships, and of course I'm going to talk about taking control of your health and fitness, and taking that to another level as well. So we're going to ball out until we fall out, alright? I want you to come and hang out with us. It's going to be a life changing experience, alright? Head over, get your tickets. Go to www.TakeControlWithET.com. Www.TakeControlWithET.com and use the promo code 'HEALTH' and you're going to get a 10% off exclusive on your ticket while they last. Get your ticket, alright? If you're in the surrounding area, get your ticket, come and hang out with us. Alright, I'll see you there, www.TakeControlWithET.com. 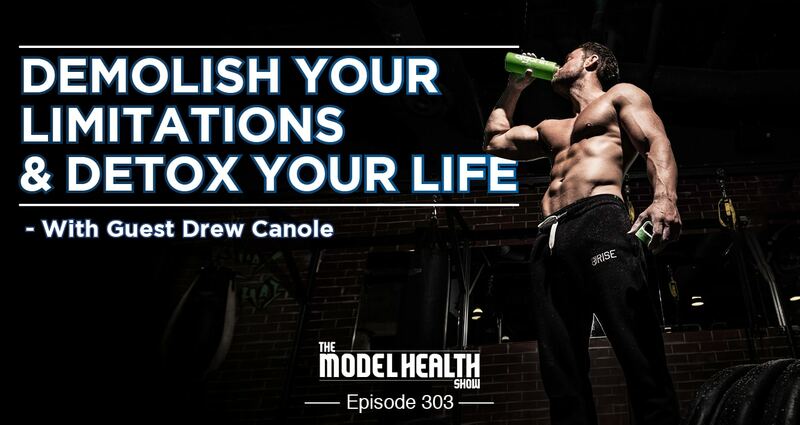 Our guest today is the one and only Drew Canole, who's a rockstar in the world of fitness, nutrition, and mindset, with a huge heart for others and doing his part to transform the world one person at a time. As the Founder of www.FitLife.tv, he is committed to sharing educational, inspirational, and entertaining videos, and articles about health, fitness, healing, and longevity. Drew believes that people are at their best when challenged, and he pushes others to bust through their personal barriers and reach new heights in physical, mental, and their spiritual well-being. Again, Founder of Fit Life TV, also the Founder of Organifi. Alright? One of my favorite things in the world. My friend, the one and only, Drew Canole. Welcome to the show. Drew Canole: Oh my goodness, Shawn. Thank you so much. I am elated to be here, and I just want to thank everybody for tuning in. And what you've created- I mean we talked on the phone a few days ago, and I remember when you first started your podcasting career on what was the be well buzz, and the ascension that you've made happen here and the amount of lives. I'll tell you what, at least once or twice a week, somebody comes up to me in the grocery store and they're like, "You're friends with Shawn Stevenson." And I've sent you a few videos here and there of people coming up to me, "I've heard about Organifi on the Shawn Stevenson podcast." So I'm pumped to be here, and we've got David Cole here as well, who's a huge fan of yours. Drew Canole: Let's make some magic. Shawn Stevenson: I didn't expect to get all this love back, man. Thank you. Your shirt! And if people are watching the video, they can see Drew's shirt says, 'Thank you, Thank you, Thank you, Thank you.' I love it man, thank you so much. Shawn Stevenson: And speaking of ascension, man. Like you know, I've known- we've had like a parallel universe that we've been going on in much the same direction. And you know, what's so beautiful about your new book, your brand new book, man I'm so happy for you, and it's such a great time right now for you to share this and to share your story, because I don't think a lot of people know your story. They see the success. You've impacted- you reach literally millions of people, incredibly successful companies that you started, but people don't know where people come from, you know? And so you shared and opened up in the book some about your childhood and where you came from, man. So I would love if we could start there, just talk a little bit about your early years and growing up. And for me, my childhood was- I was tortured. I was abused as a kid, physically neglected. If I couldn't tie my shoes fast enough, my dad- my own dad, born into this experience, would actually put cigarettes out on my forehead. Like think of the worst stuff that could happen to you as a child. I would be in the bathtub getting a bath and he would pull me up out of the water and he would hold my head underneath the water as if I was trained like a Navy Seal when I was three or four years old. Right? So things that should not be happening to a kid was happening to me, so I embodied all of this trauma as a young child. I didn't know how to deal with it. Right? So I froze a lot in my life. I had learning disabilities going through school. They wanted to give me ADD medicine. I was adopted at the age of five, luckily into a family where my mother and dad had the biggest hearts out of anybody on the planet. So much peace, so much grace, so much love that it created a container for me to actually grow in, and facilitate that healing. Right? So that I could excel with what I'm doing today, because without them, I would have tons of trauma still embodied, and I'd probably be making a lot worse decisions than I've made. I kind of went on the opposite trajectory. I was like, "Alright, so I was tortured, but let me look outside and see how many people are torturing themselves every day. How many people are eating the wrong things? How many people are choosing the wrong choices day in and day out and impacting their own bodies?" Drew Canole: Right? I'm guilty of it, too. I'm not a master, I'm still very much learning this process, but I think my childhood really set me up to have deeper levels of compassion. I really feel people, I'm a total empath, I really get them, I see their heart, and now we've built a community at Organifi, and it's just been absolutely remarkable. So I wouldn't wish for a different beginning. Like I think it's absolutely beautiful. In fact, I've written a letter to my biological dad who did all this stuff, thanking him from prison five years ago. That was a pivotal moment in my life that changed a lot. Writing this man that did all this stuff to me, right? And thanking him for bringing me into this life experience. Drew Canole: I'll never forget, like he sent me this postcard back from prison, he was in a jail in Florida, and it was handwritten, the most beautiful words, and he painted it. He said, "Thank you so much for sending this to me. I've been in prison, I've been praying for you every single day, and just knowing that God is protecting you and everything else, and I'm sorry for the mistakes that I've made." It was very short, it was very simple, but it was this huge release. Drew Canole: So, super powerful. Shawn Stevenson: Listen, man. I know you said to kind of pull away with the empathy and the- but man, I literally- like a tear came out of my eye. But it was like- it was like a Johnny Depp tear. You know? But it still came out, man. Like that is incredibly powerful because when people see you, they don't know that that's your story. They don't know that you have a father in prison, and that you had this experience. And I'm so grateful for you to open up and share that because that, again, gives us more of a reason to stop with our excuses, to stop with, 'This happened to me, so I can't,' and to really just step into our greatness. And thank you also- I want you to talk a little bit more about this, you just said that release, you know? Having kind of this closure, but also I think it's important to communicate we can't expect that to happen, right? Because you might not get the result- the response that you wanted, but it's the fact that you did it, that you forgave. Drew Canole: Yeah, so that's where the release came in for me. It's knowing that I've done everything humanly possible. One of the four agreements is always doing your best. So I did my best in that moment for my father. I thanked him, I forgave him. I remember six years old, I would pray every single night, and I would pray for typical six-year-old stuff. I'm sure the gerbil, the hamsters, grandma, grandpa, and then one day I prayed to forgive my father and what he did to me. And it was this huge release that I experienced at a young age. Drew Canole: And that was massive. But it was also throughout my life, these levels of taking- and you mentioned it just now, of taking full ownership and responsibility in what I do expect, you know? Not having any expectations in how he's going to respond, but just knowing that I'm complete with it really sets us free. Drew Canole: And that was the big thing because I've seen so many people with similar situations, and they just hold onto it their whole entire lives. Drew Canole: It takes- yeah. Shawn Stevenson: This is literally from your book, alright? Your new book, 'You Be You,' which I want everybody- preorder your copy today, if you're listening to this when this first comes out. And what's the release date? Drew Canole: October 16th. And this is the first podcast that we've talked about this on. Drew Canole: So you're the conduit, you're the vessel, my man. We're going to change the world together, so thank you for this. Shawn Stevenson: Let's go. Let's go. So in your book, you said- and this is quote right from your book. 'In fact, many of us look for acceptance from others before looking inward and accepting ourselves.' So this is kind of like a pivot from what you just said. Can you talk a little bit about that? Drew Canole: Yeah, so the whole world is based on the external data that we get from the outside. Right? We look on Instagram, we look on Facebook, we see all- everybody's an Instagram model now everywhere you go. Everybody's a Facebook influencer everywhere we go. So it's a very pushing type of mentality, it's very masculine. So feminine is to receive, and male- us men, we have feminine energy too. We have divine feminine and divine masculine. So to totally just be in the state of receiving, and knowing that the more we go within, the more complete we are, the more love we have for ourselves, the less stories, the less- we'll call it rackets, the less our psyche tries to sabotage us. The monkey mind, right? Because what is it? If you can have no- it's an African proverb, and I've heard Les Brown say this. If you have no enemy within, the enemy without can't even touch you. So really getting clear, not having that voice that's constantly beating you up, tell you you're worthless, telling you you're not enough. But being your own lover, being the deepest lover of yourself, and then nothing else can ever stand a chance against you when you're coming from that place. But so often, and I see people just destroy their lives seeking external validation. They've got the cars, the houses. "I'm going to sell this car so I can have the newest one." Or, "This relationship is kind of complacent and stagnant, so I'm going to get a divorce, and I'm going to go find another girl." It's like this perpetual thing that human beings get stuck into. So really the point in 'You Be You' is really turning into your own greatness and recognizing that you're connected to everyone and everything else. It's super powerful. Shawn Stevenson: Man, it is. It definitely is. And I want to get into some of the nuts and bolts of how to actually experience that, because like you said, we're so externally motivated and externally focused, we see everybody's showing their highlight reels, you know? And what do we do to really find that happiness and sense of- the fact that we are enough. And one of the things you talk about in the book- so the first section of the book is really dedicated- and I love this term, and I want you to drill in on what this means, and we can talk about how to do this, but is to detox your life. Alright? Detox your life. We've heard about this for our physical health, but you're saying to do this for our life in general. Drew Canole: Yeah, so how do we detox our life period? That's the biggest thing. And we have a report online that's called The Alpha Reset, and over two million people have downloaded this fast, right? It's a three-day juice cleanse for the physical, but really what I discovered in listening to people that would go through this three-day detox was that the creative level of their mind- they would get to this silent place that still small voice. They would start to hear it, and maybe they haven't heard it for five, ten years, they would start to hear the real them. Not the cluttered them, not the them with all the limitations, not the them with all the setbacks and all the bad things that have happened in their mind that the monkey mind is still making this chaotic noise with. But it was this serene peaceful level that they would get to by detoxifying that would allow them the creative faculties to open up, and they could start to piece together what they really wanted to do on this planet. They would start to lose weight naturally. I think emotionally, spiritually they would lose the weight first, and then the physical body would just confirm, right? The chemicalization of thought. So the chemicals of, 'I've been being inauthentic my whole entire life, and my true path is to start my own podcast, Shawn Stevenson, and be the real man that you see today.' And you've been living proof of that, you're demonstration of you being you, dude. Everything you do is authentic. Drew Canole: And it's paid you back tenfold. So detoxing your life is number one, getting rid of the toxic relationships. Right? Because we get complacent in the relationships around us. We love to be with other people. People have a fear of being alone. Like that's one of the greatest fears that's plagued humanity, right? So alone, if you look at it, can kind of be like a hell realm or a realm of discomfort. But on the opposite end of that is the all one realm, and when you become in that state- the toxic relationships, because of- and I don't want to be too woo-woo on the show, but they just kind of fade away. You start to call in and declare greater friends, greater relationships that support you on your life's mission. But you have to be aware of which ones get to go, and there's a lot of relationships we have throughout our cycles that we go through that are completely toxic. Drew Canole: Yeah, fill in. Shawn Stevenson: You and I both know this, and we've seen this firsthand, and I'm telling you everybody listening; please, please, please hear this because he just touched on something so powerful of this fear of being alone. And that's natural. That's that basal ganglia, right? That's that part of your brain just like- it's survival, it's concerned, it's very emotional. But he just touched on something of you're never really alone, you know? Like we are all kind of- it's so crazy, Drew, if we really take this meta perspective. If you even zoom out and looked at the planet just from outer space, how big are your problems? You know? But the reality is we're all here, and we're in this kind of universal body. We're not really alone, we're all connected if you look at string theory and all these things. But what he's talking about though with being alone, and just to really get to the science of this, and the practicality is- and what we've seen in both of our lives. You let go of that, you're making room for better, but you have to let go. Like we try to crowd things in like, 'I want this, I want better health, I want better relationships, I want this person in my life,' but you're too busy with Sarah and Becky. No offense to anybody named Sarah, by the way, I love that name. Drew Canole: Sarah is the worst, I mean let's face it. I'm just kidding. Shawn Stevenson: So many good songs with Sarah. Sarah Smile, Sarah Sarah, what happened to you? Drew Canole: Yeah, remember the eighties song, "Sarah"? Shawn Stevenson: This is happening right now, guys. Drew Canole: There it is. Shawn Stevenson: Model Health exclusive. So let's talk about this a little bit more, man. Because I think- and you as well, is that letting go of that. Even if like people are in your life for a season, but letting people go, letting those relationships go that are holding you down so you can make room. Drew Canole: Yes. And that doesn't have to be- we don't even have to put a name on it of the person in your life. One thing that I advocate for is actually becoming so- like a scientist, so concentrated on what your want is, what your desire is for those relationships, how those people are showing up. So if we were to forecast six months out, and you have this new relationship, what does the person like to do? What are the non-negotiables that go with who you are as a human being? Maybe the person loves to read. Maybe they love to talk about string theory and quantum physics. Maybe they love to go to the gym, right? Whatever it is, write that down, and what you'll see is all of the disconnect, all of the other things that don't match up with those non-negotiables and the things that you actually desire, you'll start to notice, and your preferences will become greater leading you into a place of being more in alignment with those things that you love anyway. So it's not like I have to cut these people off. What you really get to get clear on is get silent, go within, and figure out what's going to lead you to your next evolution and call upon that. Because it will show up. Like it will show up. I'm surrounded by some of the greatest people on the planet, they're all- when you walk into the Organifi office, you will know the energy. You're like, "I just want to hang out here." People come to work at our office all day because they feel the energy, and the same thing when you're around Shawn. It's just this contagious atmosphere that you create. Shawn Stevenson: Oh man, I love that so much. So in the book as well, you said that as a result of the daily compulsion to be liked, and valued by others, we end up in an endless cycle of people pleasing, leaving us empty and unfulfilled. You know, we say yes when we want to say no, we push our true selves down even further rather than establishing boundaries and standing up for ourselves and what we know to be true. Talk about why you wrote that. Drew Canole: Well for me, being vulnerable. One of my biggest challenges throughout my life- our mess is our mission. So one of the biggest messes that I have because of my impulse of not being loved, that young- you know, you heard about the trauma a little bit ago, wasn't good enough. So what did I do? I wanted everybody to like me. So I was the yes man. I didn't stand in my personal power. There was never a no, there were no boundaries, I was the guy that would be asked to do things that were unimaginable to anybody else, but I would be there doing them because I thought in some way if I said yes, that person would like me more. But it wasn't really liking the me, it was liking the things that I was doing, not the ways that I was being. So I started to focus more on my being around the people that I love. I started to realize that in being a yes man, I was actually the greatest taker because it was all about Drew. If I'm saying yes to you, and I don't really want to do it, I'm actually taking. I'm actually stealing from you, right? So it's the switch of the mind. I'm trying to get something, I'm trying to get that emotional fix, so I'm the taker versus just authentically doing it because that's who I am. And human beings are smart. Subconsciously we know it if somebody doesn't want to do something, right? Drew Canole: Like the story of your little son. Like I mean, it's just so cool the awareness that he has at such a young age, it just goes hand in hand with that. Shawn Stevenson: Yeah, man. So powerful, and it's just a great example of how we influence our environment, you know? And you know, something else I want to ask you about in this kind of same lane with detoxing your life. So it's not just relationships though when we're talking about detoxing our lives and making room. What else are we looking at here in this area? Drew Canole: Well one of them is the time, right? Like we fill our time with things that really don't serve our soul's purpose or what we really want to create. We're always trying to go, go, go, especially in the United States. We're always trying to fill that void that can be coming actually from within. Drew Canole: So once you realize what you really want, and that's when we start to get into the 'Whydentity Process" in detoxifying our life, right? And I've heard you say this before, but a 'why' that makes you cry. Like we do things that we don't love, and then we wonder why we're not healthy. We wonder why we get to fifty or sixty years old, and we feel like we really haven't lived. So what I'm a big proponent of is becoming so grounded in your 'whydentity' I call it in the book. Imagine your identity backed by a 'why.' Something that's emotional, something that moves you, something that springboards you out of bed. And once you start living from your 'why,' your 'whydentity,' and you and I talked about this on the phone, like what really moves you is the cascade of testimonials coming in like a tidal wave for you of people that are healing themselves and the awareness that you're spreading from your podcast. That's a strong 'why,' dude. Like showing up in that. So we encourage people at Fit Life TV and Organifi to find their 'why.' So it's not all about superfoods, it's actually about rediscovering who you truly are, and living from that 'why,' and then taking radical action on it. Shawn Stevenson: Man, you know what? This is like- for me and thinking about the time, and how much- it's not just investing our time more intelligently, but realizing- just taking a step back to detox where we're wasting time as well, you know? Shawn Stevenson: And how many things are just so unimportant. When we've got, "I want to write this book, I want to write a bestselling book, I want to work on developing a better relationship with my son, or I want to develop a better relationship with my significant other, or I want to start this business." But then we're like scrolling all day, right? We're just- we're doing thumb crunches, right? We're just- our thumbs have abs. We don't have the abs, the thumbs have abs, right? And understanding like we need to detox some of these things. And so putting things in proper perspective, if we need to take action even to- there are like apps that can block you from using apps, for example. You know? Shawn Stevenson: And making time, because that's one of the things, Drew, that people say is like, "I don't have the time," right? Drew Canole: Yeah, that's a big thing that people say. So doing a cell phone detox once a week for a day, like just give your cell phone up. And you want to talk about quality time with your loved one? And I know you talk about this, but go out on a date, and don't bring your phone. Like just get rid of it. Give up the news. I know if you're listening to this podcast, you probably don't watch the news anyway, but giving that up was huge for me. I mean, I haven't watched the news in probably twenty years because it's anything that causes- and we talk about the subconscious mind in the book, which you're a big fan of too, anything that causes the subconscious mind to give energy to that's negative, you want to eliminate that. So it's almost like you have a guardian standing at the portal of your door of thought, and anything that you don't want in consciously, you're wiping it away, getting rid of it. You're detoxing all those thoughts. All the limitations, all the noise. It's so noisy, right? So people- this human body is much like a container and a lot of people are just leaking stuff all day long, and they wonder why they're adrenal fatigued or they're in autoimmune, right? It's just your body is attacking itself. So spiritually, psychologically having a full container, like it's all about detoxifying your life first. Shawn Stevenson: Man first of all, when you said people are leaking stuff, I was like, 'Uhhh, diarrhea? I don't know.' But in a way, if you think about it, it is kind of like a spiritual diarrhea, you know? I think we just made something new right here, man. And so we have this process of like leaking out things that are kind of nasty and toxic because that's what we've inundated ourselves with in a way, and so we're just going to be squirting it out. Ew Shawn, alright we'll just stop right there on that one, but just being more mindful, you know? You are- what you intake is what you're going to- is what's going to come out, you know? What's going to be the outtake. Drew Canole: Yeah. Yeah, and it's so powerful, man. You have a lot of coaches that listen to you, and a lot of health professionals, and one of the things that I've seen firsthand people do that are in the health business, or even emotional intelligence, right? You go to a weekend course and then all of a sudden you're this emotional intelligence expert and you want to fix everybody in your family. So the universal law of containment and the universal law of non-interference, these are old ancient laws that you can Google or look up in your spare time, I talk a little bit about it in the book, but you don't want to interfere, right? They're going through that lesson. Like you don't have to be the coach trying to save everybody, and when you do that, when you come out projecting versus being in a receiving zone, that's actually the leaking. That's actually the spiritual diarrhea that we talk about, right? So making sure you're whole first, because there's a lot of health coaches out there, as you've seen, I mean they're preaching the word but their life is completely different. Shawn Stevenson: Yeah, no I totally understand, man. Yeah, and it's that congruency. That's a big word, and a big thing that just like rings true in what you do, and why I really respect you, man. And you know, to shift gears a little bit here, I want to talk about this other section in your book, and when I heard it, it was like- it just speaks to me because it's something that a lot of times these are self-induced, right? Our limitations. And so you talk about taking time to crush your limitations. So first of all, let's talk about limitations themselves, like where is this stuff coming from, and what are some things we can do to start to break through those? Drew Canole: Yeah, so the big thing, and this has been a constant journey for me in my life, is recognizing first of all where they do come from, and we get programmed since we're born. Limitations from our parents, limitations from the government, society, our friends, and most of the time it's so noisy up here, we have all of these limitations floating around, that we don't know what to do with them. So some of the biggest ones, we've got lack of self-worth is right up there, which creates- I mean if you think about what we talked about, the thumb having abs, lack of self-worth, you're literally scrolling, you're looking at the people that are leaving comments, and liking your photos, and liking your podcast, and liking every social media outlet that you have to get the dopamine rush, to feel that connection of something outside of you, that external thing, when deep inside of you it's really a self-worth thing. I've seen people fall apart, right? We look at suicides that have happened in the past, when somebody places their whole identity on a business that's making billions of dollars, and all of a sudden, things shift, the trends change, and then six months later they committed suicide. Their identity was attached to something that was outside of them. So removing- not being attached to that and removing those limitations of self-worth. One of the greatest billboards we've ever created for Organifi was in Little Italy, we posted 'You Are Enough' on a billboard. No advertising, but we just wanted to remind people that just by being them, they are. Right? They are enough. So you've probably heard the quote, 'If you're alive and breathing, your purpose hasn't been fulfilled yet.' You're here for a reason, you're here for a mission. So really helping people wake up and get rid of the limitations so that they can do that. A lot of people are just afraid, too. They're frozen. So in my experience, all the trauma that I experienced as a child, and you'll get a kick out of this if you've ever read any of Peter Levine's work, we freeze because of the trauma, right? So if you look at a gazelle running out in the Serengeti, and it gets attacked by a cheetah, and the cheetah drags it back for the other little cheetah cats to eat, if the gazelle is not dead and it goes away to grab the little cubs and the gazelle runs away, what does it do when it gets back to the herd? It shakes, right? It tremors. So there's therapy called TRE, which actually is tremor release therapy, and you get rid of the in-bodied limitations, the in-bodied fear from all the trauma that's happened in the past. And what's crazy is as adults, we go into turtle mode, right? We're always like this, because we're turtle shell, we're shocked. We want to remain frozen and that trauma keeps us small. So really doing the work, releasing the trauma, releasing the fear is going to be quintessential in you getting the body that you want, in you being in the relationship that you want. All this information is great, you could listen to Shawn's podcast every single day, but if you're still holding onto limitations of self-worth, if you're still in that 'I can't' mentality; "I can't do this because I don't have enough money." Right? That's a big limitation. Like who told you that? Who told you that there was a limited supply of financial resources for you? Where does that come from? So really analyzing all your limitations, spending time with yourself. And I give written exercises in the book. It's a lot of work. Drew Canole: Like this book is not for the average person that doesn't really want to work. If you're looking for something just to enjoy reading and really not doing the work, then this isn't really for you. So it takes- it takes some effort to really sit down with yourself and eliminate all the noise, and figure out what path you're actually on in the first place. Drew Canole: And the limitation section is awesome. Shawn Stevenson: Yeah, so true, man. You know, I think that- and just to pivot on what you just brought up about that limitation with finances, that's one of the biggest things that you hear, you know? In any space, whether it's housing, or health and fitness, or relationships, finances are a big issue. And so having that limitation in your belief about- one of my missions is to make sure people know that it's their duty to never use money as an excuse to not do something that they want to do. Because it's not about money, it's not about that kind of resource we consider money, it's resourcefulness. There is a way- everything is figure-outable. If you had kind of like a do or die situation where you needed to get the money for fill-in-the-blank, we would find a way. Most of us would find a way. But in our day-to-day life, we just don't have to, you know? And so we use that excuse in a limitation. "Well my job only pays me this much." For real? Because guess what? The job market is not like it used to be. Jobs are not secure, you know? You need to be able to pivot. Like Seth Godin talks about, making yourself a linchpin, you know? Making yourself kind of uber valuable in various different ways. And also there are so many- there are literally millions of people who have a 9:00 to 5:00, or whatever it might be, but then they have their sidepreneurship. You know? They're doing their other thing, their little side hustle, and they're finding ways to- one guy I know, man, he is a police officer in Chicago. And I think as I'm saying this right now, I think I need to have him on the show. And he has created a life for himself. He thought- he just knew he was going to the NFL, you know? And it just didn't work out for him. And I'm going to have him on to share the story, but then he spent time- and his whole family, everybody is police. His mom, dad, brother, everybody. And so he went into the police corps after college where his friends went on- some of his friends went to the NFL. In some cases he was better than them, like he was the captain, and he saw their lifestyle, you know? He's making $1,600 every two weeks, and some of them are making $100,000 a week. Right? And seeing that lifestyle it changed his perception, and he knew like, 'Instead of me having this excuse about I can't live this lifestyle because of this,' he found ways. He got into a certain business, which I'll save that for him to talk about, where he got one thing to cover this bill, one thing to cover that bill, like various things in his life, multiple streams of income, and he figured it out. And now today, man he is one of the most successful people that I know, and he still kept his police officer job, which is crazy. I mean he's making millions and millions of dollars, and he's like the richest cop on Earth, alright? But you would never know, he would not talk about it. It took so long for our guys to figure it out. By the way, I'm pretty sure he's going to be in San Francisco, so make sure to come and hang out with us. Take Control Conference, San Francisco, www.TakeControlWithET.com. But Drew, listen man, that's my big passion is getting people past that limitation. But I would love if you could talk about- like what's something else that we can do? Because we have this kind of glass ceiling. What's something that we could do to start to break through this limiting thing that we might have on ourselves? Drew Canole: I'm glad you asked that, and this totally relates to your buddy that's a cop as well. And I think the big thing, if you ever study Nikola Tesla, which you probably have, and you look at Einstein, they talk about energy. They talk about frequency, they talk about vibration, and we are vibrational beings, I believe. We are energetic beings. Every single cell broken down in its purest form is literally light. So if that's the case, then choosing frequency positions in your life. So the example that I like to use is I had a mentor tell me once, he said, "Drew, you could choose to have coffee at Starbucks, or you could choose to have coffee at the Ritz Carlton. They're both going to be about $5, but the frequency and the energy is going to be different in those two environments." So it's the choice point throughout the day. We're filled with thousands of different choices to make relative to the thinking, relative to our action, ways of being, but constantly looking for choices that have a higher frequency, that have a higher energy. So when it comes to your time, right? How can you become the most valuable person in that? Right? Do something that's great. If you're going to live on this planet for an extended period of time, why not live big? Why not live your dreams and the money scarcity thing hits home with me too because I remember when I started Fit Life TV, right? I had no money to start it, but what I had was passion, I had enthusiasm, I had an HD flip camera, and I was just like, "I'm going to shoot a video every day, and whoever is supposed to be there, I'm going to add so much value to them that eventually one day the money will come, but I'm not attached to the money." I think people that chase money, sometimes money runs. I'm the type of person that chases change, like legit human change, and you're that way too, and the proof is in the pudding. So do stuff that lights other people on fire, and your business- you'll have massive success in whatever you do, and you won't ever have to worry about money. You think the lion wakes up in the jungle and he's worried if his meal is going to run by at noon? Or does he just wake up and go pounce and get his food for the day and then he's like, "Oh, there it is." Human beings consciously, we're so worried about having enough, that just has to go. Like especially when it comes to dealing with weight loss, and physical issues, and healing, like know that you're taken care of, know that it's coming, and when you get to that level, like I've seen miracles in my own life over and over and over again. I mean we've hit- with Organifi we've been on Inc 500 three years in a row, like 110 employees, like best place to work, fastest growing in San Diego, like crazy stuff. But it's not because I'm chasing that, right? We're just creating that vibration, we're creating that frequency. So what are things that you can do in your life that are going to build you up? If you like music but you haven't played music in a while, or you used to play the guitar, you used to paint, you used to do all this creative stuff but for some reason you let it go because you're consumed in working and making money, get back to the basics. Get back to what really sets your heart on fire. Drew Canole: And you'll see that the money will start to shift, too. And the body, right? You do the body all the time. You're on Instagram, you look great, I see you training with Weatherford, Drew Manning you were with last week, or something like that. So the fastest way to demonstrate manifestation of thought and of what you're putting in your mouth is what your physical meatsuit looks like. So once you master the body, which is detox your life the first level, limitations, then you get into how do you use your spirit body to start to create opportunities, situations, and experiences that attract multitudes of money and people and resources to you? And that's what I'm passionate about, and I know you are too. Shawn Stevenson: Yeah, so true. So true. And you know, I just want to stay on this, because you just talked about Organifi, and you know, over the years, man, and you know this, when we first connected on this and you told me that this was coming down the pipe, I had tried- man, dozens of different green blends. I was spending money I didn't have. Years ago, almost fifteen years ago I was doing this stuff, and man- but the thing was, first of all, the combination and also nothing tasted- actually tasted good, and that was the big thing. But the nutrient density is off the charts. You've got the spirulina, you've got the moringa, you've got the ashwagandha. What is so special for you? You're in it, like this is around your- this is who you are, you're like the center of this universe. What is so remarkable about Organifi that you are so passionate about people having this as part of their daily lives? Drew Canole: Yeah so for me, and I really haven't shared this with too many people, but I believe in one choice. One decision can radically transform your entire experience. I mean I'm living proof of that. When I first got my green juice from a guy named Mark, he was given six months left to live, and he handed me this green juice and he said, "Drew, this saved my life. I cut out all the processed food, the sugar, the dairy, the wheat." He handed me this green juice, I drank it, right? It was three ingredients back then, seven and a half years ago. I lost forty pounds legitimately in ninety days, transformed my life, my thinking became more clear, I was focused on others for the first time in my life versus my limited self focusing only on me. And then I was like, "You know what? But this is hard." For four years I shot YouTube videos almost every day, right? Grew this YouTube channel, the social media. I'm like, "How do we make it easy for people to get access to organic turmeric?" If you go to Nebraska, and these other parts of the US, and different parts of the world, they may not have it. So how do we source the best ingredients, putting it together so everyone can make that one choice every morning? And I'm convinced, if you do nothing else but you make one habit shift, that one choice. Darren Hardy talks about it in his book 'The Compound Effect,' it's going to build up. The ripple is going to get bigger and bigger. So maybe this week it's just one juice. Maybe next week it's one juice and a five-minute sprint. After that, before you know it, you're in the gym with Shawn working out next to him like living the life of your dreams, you've got your own business, whatever it is that lights your soul on fire. But it takes building up the momentum from that one choice, and I believe when somebody orders Organifi, and they drink it, and they taste that minty tea flavor with the moringa, and the spirulina, and the chlorella, and they know that they're giving their body the very best nutrition on the planet, they're enrolled in the bigger version of who they ever thought they could be, and they're going to start to see that. Because the brain is really a mirror, right? Whatever we ask for, whatever we declare, it's rippled back to us, that feedback loop. So really we're creating a life that's worth living by making that one choice every day. Drew Canole: And I've seen it thousands and thousands of times again. I'm like, "Oh, there they go. You watch this person six months from now, a year from now, their life is going to be forever changed. Shawn Stevenson: That's powerful, man. That's that first domino. That's incredible. I love that assessment, and by the way guys, exclusive Model Health right here, www.Organifi.com/model, 20% off. That's www.Organifi.com/model, 20% off. Organifi green juice, it's a must have. Like man, my kids drink this, you know? In the cup with the straw. The straw makes all the difference in the world, man. The red juice, the gold, so many incredible things. 20% off everything, guys, so head over, check it out, www.Organifi.com/model. Drew, listen man, one of the final sections in your book, you talk about this concept- and this really is a transition because of detoxing your life, crushing through your limitations, and doing the exercises that are there. You talk about owning your awesome. And I was just like, "What? What does this mean, own your awesome? Own it?" Of course, I do- of course I do resonate it and know what you mean, but I would love to get from you what does this mean from a tangible place for people? Drew Canole: Yes. So tangibility is as human beings we need reminders because of the noise, because of the distractions, because maybe the 9:00 to 5:00, the kids, the people that are around us. We need to remind ourselves of why we're here. Right? So constantly looking at the 'whydentity.' Like why am I doing this? Why am I running Organifi? Why do I have The Model Health Show? Day in and day out, because there's going to be days that you just feel like giving up. I know I've had them, maybe you haven't, but there has to be a conviction. There has to be a commitment to blast through those walls. And when you truly own your awesome, you're sitting in that place consistently. You're focused on others versus yourself. You're focused on the changes that you can make in other people's lives while loving you unconditionally, wholly, acceptance over everything. Drew Canole: Like all the stuff that maybe held you back as a teenager, a young adult, it kind of just fades away as you age into owning your awesome. And an exercise- a tangible exercise that I do every day without fail is I do what's called 'vision casting,' and that is- first of all, the power of visualization is crazy. If you've ever looked up some of the research behind this, Olympic athletes you've all heard- before you do an exercise, you visualize it and the muscles respond to the visualization. So vision casting the future you, what does it look like? What does it feel like waking up? Maybe your goal is to lose twenty pounds. Owning your awesome, what does it feel like to wake up ninety days from now and lose the twenty pounds? What do you hear from other people? Write it all out. What do you hear from your wife? What do you hear from your husband? The people that you love? The friends? The family? What are they saying to you at this time? So at the very beginning of Fit Life TV, I had like twelve views on my YouTube videos. I remember, and I had no comments, but I would mentally go in, and I would literally sit at my keyboard, and I would write down comments to myself as if I was watching this video that I wanted to see one day. Right? So using the power of written word, declaring it, owning your awesome in that is incredible. And I think another aspect of that is realizing that there's no separation between us. So when your podcast does well, like it impacts so many other people that we're connected to. So I want to help you do that. There's no separation between us, right? When somebody comes into Organifi- and a perfect example of this is my CEO now, Jamelle Louie, needed to move out of his house real quick, right? He got into a little- I'm not going to air his news on the podcast. But there was a little struggle there, so Jamelle and I both went to his house and we helped him move for the day. Right? So owning your awesome is being a stand for other people that you care about and you love, and realizing that we're all connected. Realizing there is oneness. Like the separations of countries, of religions, of everything that we see is really a limitation, and when we get past that as a human system, we're like an organ on the planet called Human for Mother Earth. When we're tapped into that, like that's what's going to change things, but until- I could go on for days talking about this, my man. But I love that question. Shawn Stevenson: Yeah, man. So, so good, man. Own your awesome. So owning that uniqueness, but also understanding that we are all connected, and in that, we own our awesome, we're helping to uplift everybody else, and I think that's so important and so valuable. Drew, I'd love if you could share where people can connect with you online, and also let them know where to pick up- if you've got some bonuses or something, let us know. Drew Canole: Yeah, yeah, yeah so you can go to www.YouBeYouBook.com. So when you get the 'You Be You' book, you're going to get my 'Upgrade Your Life' masterclass. It's four videos that are going to help you with your environment, right? Going through the 'whydentity' process that we talked about. You're also going to get a bonus PDF of the Self-Love Checklist. It's going to go through and kind of rephrase some things that maybe you're questioning in your mind and help you get more clarity on what you really want. And then also, another book that I wrote called, 'Train Your Taste to Trim Your Waist.' So that's about nutrition, health, it has our fast in there, our detox, how to eat, that kind of stuff. That's in the PDF that you get when you bonus- when you order it at www.YouBeYouBook.com. Shawn Stevenson: So that's free. Drew Canole: It's all free. Drew Canole: Yeah, just for preordering. Shawn Stevenson: Perfect, perfect. So where can people connect with you online? Drew Canole: So you can go to my Facebook, which is Drew Canole, www.FitLife.tv, or Organifi that you mentioned, www.Organifi.com as well to get 20% off everything and radically transform your life. Shawn Stevenson: Perfect. www.Organifi.com/model, that's where you get that hookup. Shawn Stevenson: Final question for you, man. With this new book, and you putting your heart into creating this, 'You Be You,' what is the model you're here to set for other people with this book, 'You Be You'? Drew Canole: Yeah, I think the model that I'm here to set is really remembering how powerful you are as a human being. How much impact that you're here to make, and if you're in a place of complacency or you feel stuck in your life, the exercises in this book will help you break free from that, and really own who you are. I just see so many people that I want to help, and I know this book is going to set them on the right course for that. Shawn Stevenson: Drew Canole, you're the man. I appreciate you, bro. Drew Canole: I appreciate you too, my brother. Shawn Stevenson: Awesome. Everybody, Drew Canole. Listen, everybody, thank you so much for tuning into the show today. I hope you got a lot of value out of this. Man, he said some- what I'm into, it's not just knowledge, I'm into profound knowledge. Like something that's profound that changes the way that you think, that changes the way that you compose and carry yourself in the world, and that's the kind of things that we were hitting on today. When he talked about separation, like it really hit me. All of these- this idea of separation between us, and countries, and states, and cities, it's great for a soccer game, it's great for getting the football teams against each other, but it's not great for elevation in human consciousness, in our ability to work together on one accord because all of these imaginary lines and separation, it's literally drawn. Alright? It's literally just taken a pencil or maybe it was a Sharpie and just drawing it on a piece of paper like, "Okay, this is Missouri, this is this country, this is that country." It's really just ideas, you know? In creating this separation. But of course it's important to have that sense of pride about where you're from, absolutely, but we don't want to let that dictate our ability to connect and our ability to change the world collectively. Because it's not going to be one person from one place, it's going to be many people coming together as this world family, because we really are a world community, and world citizens for that matter today, you know? More so than ever, like we can get- I could come and hang- just hours, I can be in China like hanging out, you know? It's such an amazing time and opportunity for all of us. Guys, I appreciate you so much, and I just want you to really take this message of being yourself. I think it's the greatest gift. Be yourself, everybody else is taken, alright? It is the number one leverage point, it is the number one tool and gift that you have to be successful in your life. It's the number one thing. Drew talked about this, he knew from back in the day, you know I've been putting in work, and really working on being just more and more authentically who I am, and that's really the breakthrough moment is not holding anything back, because the right people will be connected with you. We don't need to worry about everybody liking you, and being that person who's looking for people pleasing, but understanding be authentically you, and the right people will be attracted to you. I'm here to be of service, I'm here to help change the world in my own way, and to inspire minds to help to be on this mission with me. And thank you so much for riding with me on this, I appreciate you so much. We've got some incredible guests and incredible episodes coming up, so be ready. Shawn, I love your show and the guest you invite and the knowledge bombs that you drop. I just heard that you want to invite your successful police officer friend, I hope he agrees to come on your show. He sounds like an amazing yet humble man. In addition, I would like to take the opportunity to ask about making more women health show. I am pregnant and it’s hard to find material about what is safe to consume and do. I was taking Alpha Brain and Ocean Alive, etc. and it all has warning signs to talk to a doctor if pregnant. I thought it was all natural and therefore good. I get the okay for physically doing things but not for consumption of products maybe because the physicians are not informed too. That is my guess. By the way thank your wife for sharing her experience. Maybe she can come on again to talk specially about her pregnancy nutrition.